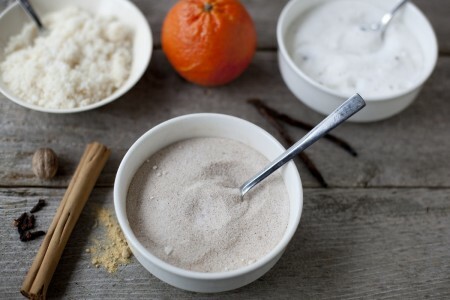 Although I have been switching our family to using sucanat in place of refined sugar, there’s a small happy spot in my heart that sucanat hasn’t filled; the flavored sugar spot. There’s something about flavored sugar that speaks to me on so many levels. They speak to the freakishly frugal part of me, to the gourmet loving refined palette part of me, and to the part of me that loves DIY projects and secretly wishes I was a pioneer of old. Flavored sugars take about five minutes of work and make a fantastic gift that’s cheap and easy. 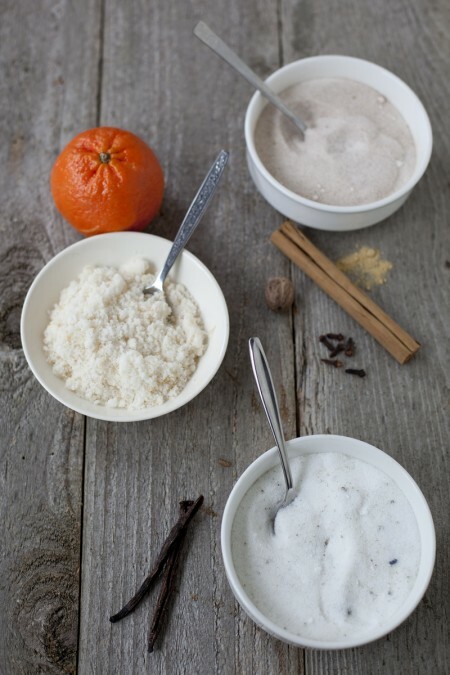 I first discovered flavored sugars as a child, when my mom taught me to make candied orange peels. The sugar we packed the peels in tasted like oranges after the peels were removed. We’d sprinkle it on French toast, on top of cheesecake, or use it on sugar cookies. It was as good as fairy dust in my mind and in fact I remember once sprinkling some in my hair, hoping it might infuse me with special powers (no such luck!). There was also cinnamon sugar, a favorite of many childhoods. Cinnamon sugar toast was snack I had at pretty much any friend’s house (as well as my own) and is one of those foods synonymous with comfort. We always had a container of cinnamon sugar at home that we used not only for toast, but also on tortillas spread with butter, rolled up and microwaved for fifteen seconds until they were soft and warm and oozed golden sweet cinnamon juices. As I got into cooking as an adult, I was using my first vanilla bean and was shocked when the recipe I was trying called for only used the inner seeds and said to discard the pod. I paid good money for this vanilla pod! I gave up cheese this week so I could afford this vanilla pod! There was no WAY I was going to just toss it. I called a few of my friends (I did not have internet at the time, too poor!) and asked if they knew what to do. My Canadian friend came through for me and told me about vanilla sugar. I was so excited to have a found another use to stretch the cost of my vanilla bean. With how much sugar one little bean could flavor, my cost per serving was going way down. Even better, I now had this delicious sugar to sprinkle in my coffee and bake with! You can use flavored sugar in any baking recipe. Try making a pound cake with orange or vanilla flavored sugar, it’s to die for! Or use pumpkin pie flavored sugar in a coffee cake and to make the crumb topping. You’ll never want plain sugar again! Flavored sugars are also great for making the sweet crunchy top crust that no creme brulee is complete without. 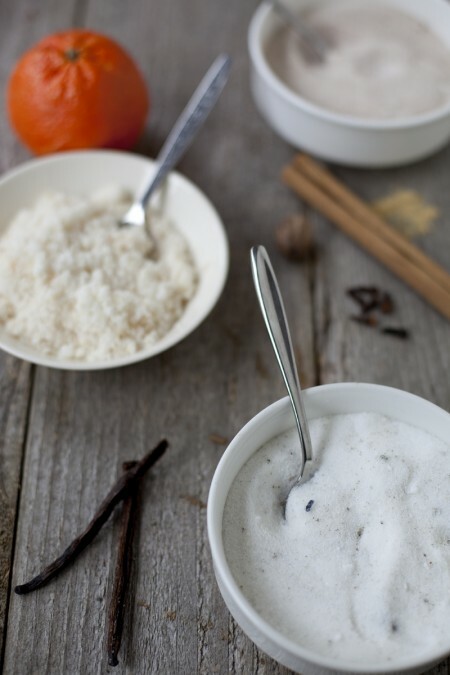 This week I’ll be sharing three flavored sugar recipes, and each recipe will list my favorite ways to use them. But I know there are so many ideas out there I wouldn’t even think of. How would you use flavored sugars?